The CN63200 and CN63400 series have been discontinued. Please see the CND3 Series as a possible alternative or upgrade. The CN63200 Controllers accepts signals from a variety of temperature sensors (thermocouple or RTD), while the CN63400 Controllers accepts either a 0 to 10 Vdc or 0/4 to 20 mAdc input signal. Both controllers can provide an accurate output control signal (time proportional or DC analog output) to maintain a process at a setpoint value. 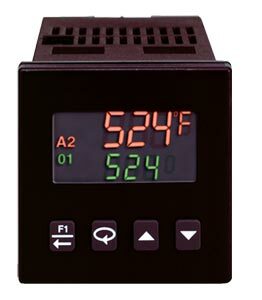 Dual 4-digit displays allow viewing of the process/ temperature and setpoint simultaneously. Front panel indicators inform the operator of the controller and output status. The comprehensive programming allows these controllers to meet a wide variety of application requirements. * Analog out may be used for retransmitted signals. When using analog output for retransmitted signals, AL1 becomes main control O1, if selected for heating in the analog out models.